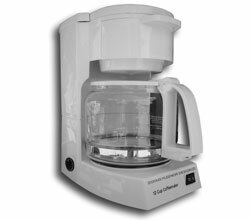 The DMX Coffee Pot, first introduced at LDI '96, was actually available for purchase for a limited time. Previously only available by lease, Doug Fleenor Design followed the lead of many moving light companies by allowing their leading edge technology to be purchased outright. Doug Fleenor believes operation of the Mark II is simple enough that the exhaustive three week training course has been eliminated. The Mark II DMX Coffee Pot features internal termination (there is no feed through), and remote address setting (there is no DMX address switch). Remote address setting is accomplished via RDM making this the first (and only) RDM Coffee Pot as well.